One of the first depictions of this imperial animals on Tuvan territory was found by archeologists in the district of Upper Yenisei. An ancient artist engraved the drawing of a camel already in the first century before our era. 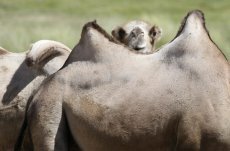 The camel - "teve" - is mentioned many times in Tuvan folk epics, where the animal is compared to the hero-warrior, whose nostrils spout smoke, and whose step shakes and crumbles mountains. There have always been camels in Tuva. Nevertheless, they remain, and probably will remain exotic even for Tuvan residents for many years to come. Sergei Shoigu: "It is incredibly interesting to study one's own native country." A presentation of photo-album "Black and White Tuva. 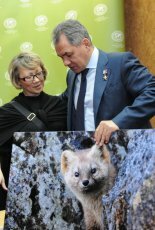 Unfinished history…", which was published on the initiative of Sergei Shoigu with the support of Russian Geographic Society, took place at the National Museum of Tuva. The event had additional ceremonial aura because of the presence of artists from the National theatre of Music and Drama in historical costumes; Kaigal-ool Khovalyg, National khoomeiji, played the igil. Huge numbers of photographs from personal archives of travelers and residents of Tuva were collected in the album, but the majority belongs to the first director of Tuvan State Museum Vladimir Yermolayev. 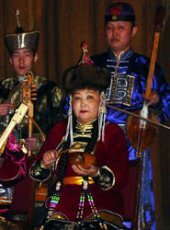 Tuvan singer Sainkho Namtchylak, who has long been living abroad and who conquered world renown, will conduct a throat-singing workshop at the Museum of History of Ulan-Ude on 19-20 November. As the government press-service of Buryatia explains, Sainkho Namtchylak, who is a singer-experimenter, improviser, composer, sound-poet, and specialist in archaic singing techniques, vocal techniques of people of Siberia and Far East, represents a unique phenomenon of world vocal culture. 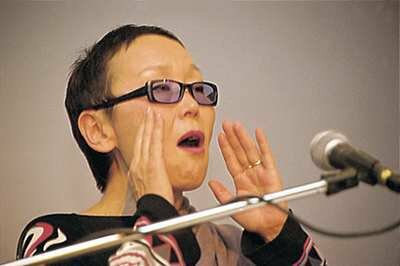 Today, national artist of Russia and Tuva is holding a benefit concert. She is saying good-bye to the State ensemble "Sayany", with whom she worked for many years. Apparently, love for folk song is inherited in mother's milk. The singer's mother, Opal Agban-Shyyrapovna, who is now 81 years old, won the Grand-Prix of festival-contest "Folk Song - 2011". At the concert, they will together sing a song about their native places. Today in Moscow there is a memorial for Alexandra Yakovlevna Shoigu, whose life has been connected with Tuva and its people for many years. She will be buried at Troyekurovskoye Cemetery next to her husband - Kuzhuget Sergeyevich Shoigu. 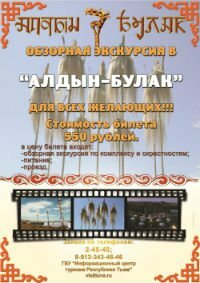 Many representatives of Tuvan diaspora will be participating in the ceremony, including members of Sergei Shoigu's party and family friends. The head of Tuva, Sholban Kara-ool has been supporting Sergei Kuzhugetovich at this difficult time. The Association of the Buddhists of Tuva (OBT) has sent an open letter addressed to Russian Foreign Minister Sergey Lavrov, asking him to grant a Russian entry visa to the Dalai Lama. The letter, posted on the website of the Center for Tibetan Culture and Information, has been signed by Kamby Lama (the head of Tuvan Buddhists) Nikolay Kuular and OBT administration Chairman Buyan Sandyk. Over the past 20 years, since the only visit by the Dalai Lama to the republic, many temples, prayer houses, stupas and prayer wheels have been erected here, the authors said.